In stock -This product will ship today if ordered within the next 3 hours and 58 minutes. 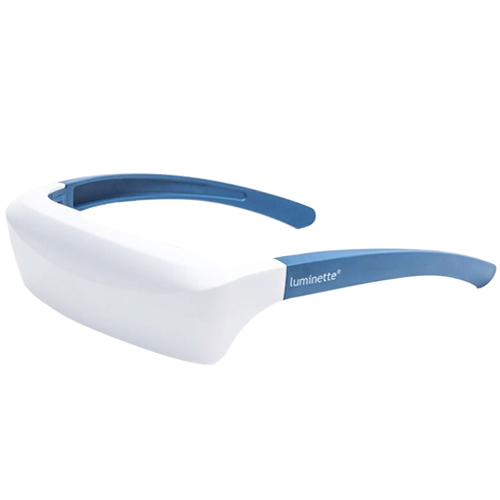 Lucimed Luminette 2 Light Therapy Visor - SAD Light Glasses is a lightweight medical device worn just like a pair of glasses. 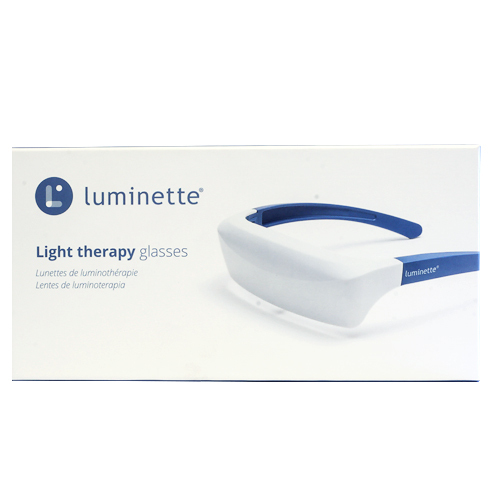 Lucimed Luminette 2 Light Therapy Visor - SAD Light Glasses is a lightweight medical device worn just like a pair of glasses. 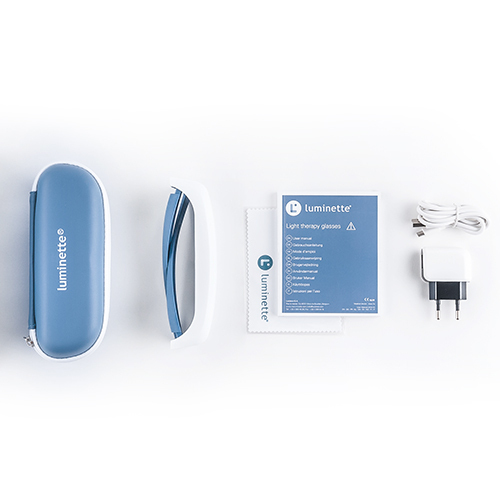 Providing highly effective light therapy on the go, it lets you go about your day without interrupting your treatment. Daily treatment is simple, easy and comfortable. Thanks to its diffractive system, the light produced by the Luminette 2 does not affect the part of the eye responsible for vision. You can still work, use a computer and read as normal. Light is sent into the eye from above (as with the sun) thanks to an innovative optical mechanism, which avoids dazzle or visual discomfort. The flux emitted by the holographic concentration device emits a light which is situated within the visible spectrum where the dominant wavelength is 468 nm (blue) while providing an illuminance of 607µw/cm² on the cornea. The appliance complies with European standard 93/42/EEC Amendment 2007/47/EC which governs medical devices and complies with the new European environmental protection standards (ROHS). Worn just like a pair of glasses. Keeps the winter blues at bay. Provides highly effective light therapy on the go. Helps disorders associated with jet-lag or related to night work. Daily treatment is simple, easy and comfortable. Treatment time - 20-45 minutes. Historically, people have tended to work outside. It is only in the last 100 or so years that people began depriving themselves of vital sunshine by spending most of their day inside. There is evidence that this dramatic shift is having profound effects on people`s well-being and sleeping patterns. SAD stands for Seasonal Affective Disorder and is a medically recognised condition that results from our body`s response to shorter days and smaller amounts of daylight. SUB SAD, or Winter Blues is a milder form of SAD affecting a considerably larger number of people. You may be suffering from SAD if you find you often feel tired or lacking in energy, particularly around autumn and winter time when the days get shorter, the nights get longer and a bright, sunny day seems like a distant memory! Lucimed is a Belgian company that markets medical devices in the area of light and well-being. The corporation was created in April of 2005, following three years of research at the University of Liège. The researchers (Dr. Renotte, Dr. Poirrier and Dr. Moreau) got together to develop a light therapy device more ergonomic than existing systems, to improve patient comfort and therefore consistency of use. *Intensity 1: 45minutes. Intensity 2: 30 minutes. Intensity 3: 20 minutes. When the Luminette 2 is out of action, please dispose of it as an electronic component, in accordance with local legislation. Below are reviews of Lucimed Luminette 2 Light Therapy Visor - SAD Light Glasses by bodykind customers. If you have tried this product we'd love to hear what you think so please leave a review. 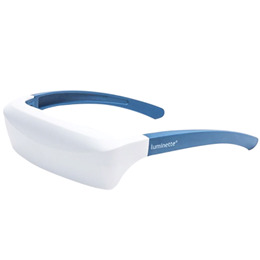 Lucimed Luminette 2 Light Therapy Visor - SAD Light Glasses is a lightweight medical device worn just like a pair of glasses. Providing highly effective light therapy on the go, it lets you go about your day without interrupting your treatment.